Volunteerism Alive and Well at First Congregational Church! Many were away over the summer and may not be aware of some of the activities surrounding our church. As most know, Rev. Lee Ireland’s last Sunday with us was June 28th. She received a new interim position on June 25th. And we had made arrangements to repair and upgrade the parsonage starting on July 1st. Talk about close planning!!! Rev. Lee rented a newly renovated home in Niantic, and the builder managed to get it done for a move on June 27th. During the last two weeks of June, several of the ladies in our church volunteered to help her pack up her belongings. We had hoped that a local moving company could actually perform the move, but summer on the shoreline is not a good time to expect a professional moving company to be readily available and at our beckoned call. So the requests went out, and you responded. We rented a 16’ truck, had six smaller trucks at our disposal along with two station wagons. At 9 AM on Saturday June 27th, seventeen volunteers assembled at the parsonage, and the move was under way. Nancy Carlson, Beth Frisbee, Sandy Clark, Susan Wickland, Bob Wickland, Bob Hansen, Matt Resnisky, Greg Burr, Wendy Girle, Bill Voigt, Carol Voigt, Charlie Renshaw, Paul Ireland, David Stoner and three friends of Rev. Lees were ready to go. In just over two hours, the vehicles were packed and the caravan left for Niantic. Once there, Lee mapped out where she wanted the furniture and the boxes, and the group made great progress in getting everything in the proper rooms and the furniture on the correct walls. By just after 2 PM the trucks were unloaded and while Rev. Lee had some serious unpacking to do, everything was in place. Toward the end of the move, magically three humungous pizzas appeared with several bottles of soda, and everyone retreated to the back deck for a well-deserved lunch and wonderful conversation and fellowship. Rev. Lee said “she had never seen such a well-orchestrated and smooth move”…and she should probably know since as an interim, moves are somewhat commonplace. Scott Hartzell, Trustee and Property Chair, would normally be the point person for any repairs and changes to either the Church or the Parsonage. Scott does have a full time job, and this undertaking was above and beyond the call of duty. In April, Charlie Renshaw and David Stoner volunteered to be co-chairs to get the parsonage restored, upgraded, painted and prepared for Rev. Jan’s arrival in late July. The master bathroom was virtually unusable, the shower had been removed, and several of the fixtures needed repair. The kitchen sink and the faucet were old and needed replacement. All the trim…baseboards, door and window trim were stained brown from the days they were installed in 1960. The doors…ten in number…to the bedrooms, closets and bathrooms were also circa 1960, and the veneer had in many cases peeled off. All needed to be replaced. Considering all the above changes and replacements, as well as upgrading and bringing the electrical systems throughout the house up to code, we estimated the total costs to be $15,000. These changes and costs were submitted to the Trustees and the budget to proceed was approved. In April we contracted with Bathfitters to install two new custom showers and fixtures. Because of the size of the bathrooms, all had to be specially ordered. They said they could do it in early July, and on July 1st, they arrived and upgraded both bathrooms in one day!!! Harold Johnson arranged for a new sink and faucet for the kitchen…a donation from Essex Meadows, and made time in his work schedule to rip out the old sink and plumbing and install the new. Total cost for this was nothing!!! We hired a local electrician to upgrade the electrical system, install new outside lighting, as well as new circuits in the bathrooms and hallway lighting. Total cost was $450…a terrific bargain for all the appliances and labor. 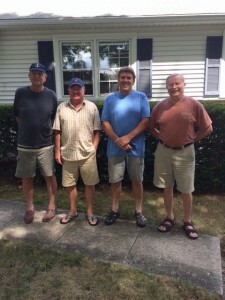 THE “SKILLS EXTRAORDINARY” TEAM: (left to right) Phil Bassett, Carpenter/Electrical Repair; Paul Ireland, Arborist; Scott Hartzell, Property Chair and Trustee; Harold Johnson, Kitchen Upgrading and Plumber. The outside trees and bushes were overgrown and ‘curb appeal’ was not at all apparent. Anyone over four feet tall were hit with the branches and limbs from the two oaks guarding the front walk. Paul Ireland volunteered to trim and shape all the trees and evergreens. Yes, the days he picked to do so were in the high 80’s, low 90’s, with 90 percent humidity. But the work was done and the debris all taken to the shredder. The landscaping work was done beautifully at a total cost of zero. Great job Paul!!! And then the painting. 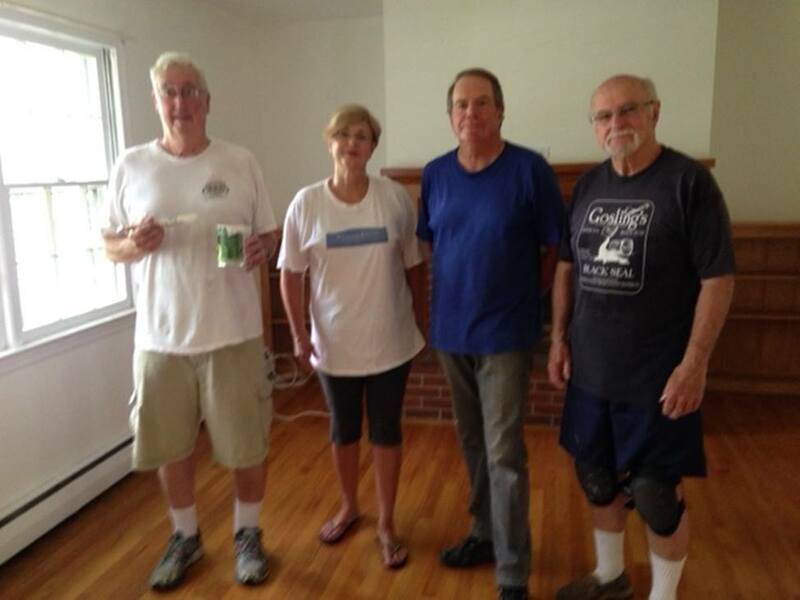 We put together a paint team of Harold Gulliford, Cathy Maynard, Charlie Renshaw and David Stoner. Firstly, everything had to be primed with a special sealer. In addition, several of the window sills needed cleaning and attention since they had suffered serious water damage over the years. That seemed easy enough, but it turned out we needed three and four coats of semi-gloss paint in addition to the sealer to make the trim and windows look bright, new and professional. Then doors to the rooms and closets were removed, and as fate would have it, doors installed in the 1960’s were the full 24” or 30”. Today’s doors are 3/16 of an inch smaller. That doesn’t sound like much, but none would have hung properly or closed. The result was that custom doors needed to be ordered, but Beard Lumber came through and notched all the doors so most hung perfectly. A couple needed to be reworked to open in a manner different from those previously installed, and Phil Basset came through to make the necessary adjustments. Phil also repaired the dining room chandelier which saved an additional $255. The cost of the new doors and brassware was almost $1,000, and another $275 for paint. The labor, over 145 hours, was donated. Just remember, there is no air conditioning at the parsonage, and several of the days were in the high 80’s with 80+ percent humidity…talk about ‘sweat equity’!!! THE PAINT TEAM: (left to right) David Stoner, Cathy Maynard, Charlie Renshaw and Harold Gulliford. But the “piece de resistance” were the pulls on 28 doors and drawers in the kitchen. They were the original pulls, and over the past 55 years were dirty, pitted and needed to be replaced. Just putting on new pulls would significantly upgrade the kitchen and we planned on about $600 in the budget to replace them. Harold Johnson had another idea…let’s buff and clean them and reuse them. Harold Gulliford removed all 28, put them on a wheel with a wire brush, removed all the old dirt and grease, applied two coats of clear lacquer and they looked like new. The cabinets were transformed at a total cost of nothing from the budget, but many hours of labor and some creativity. On July 25th we declared victory…the job was finished. We hired one of our tenants at the Pratt House to come and give the place a good final cleaning and polish the floors. I must tell you, the house sparkles…clean, freshly painted, new electrical, new plumbing and kitchen upgrade. Considering that Rev. Jan and her husband Ron saw it in February and June, the transformation was astounding, and when they came down with their movers on July 27th, I really think they were blown away. And so far as the bottom line…the total costs were $11,420 or $3,580 UNDER budget. The job was completed on time and under budget…don’t you love it when that happens!!! Thanks to everyone for a great job, well done.